Clubhouse with bar, catering, pro shop. Golf practice facilities inc driving range. The Golden Eagle Golf and Country Club was designed by the American Rocky Roquemore in 1994. 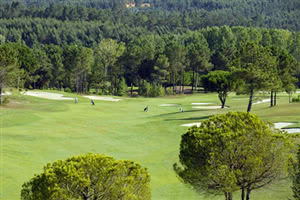 The club was one of the most exclusive courses in Portugal before it was opened to the general public in 1997. Set in over 90 hectares, the beautifully manicured layout contains 8 lakes and 88 strategically placed bunkers all set within beautiful rolling countryside and offering spectacular views. Golden Eagle offers many holes with their own individual style and distinctive features and to score well requires straight driving and thoughtful approach shots. The course is always immaculately maintained and offers and excellent golfing challenge to golfers of all ability.